The trip from Key West to Marina Hemingway in La Habana is short and easy. Our only concern was the US Coast Guard because we heard that they stop vessels on that route. We were traveling with our friend John from the US, and if they had stopped us we would have been forced to change route and skip Cuba. But we had a quiet trip and arrived to Cuban waters early morning. You need to plan your trip so that you don't arrive in Marina Hemingway with strong north winds. The entrance to the marina is along a small canal between reef and can get untenable. We arrived with NE winds and the entrance was tricky. Inside, the marina is protected, and we soon were safely docked. A good deal of patience is required to complete the entry procedures, between the doctor, customs, agriculture, port, etc it took about 4 hours to get everything completed. They come to your boat and check everything. They open all cabinets, want to see equipment, we even had to open the engine door. But they are polite and love talking a good deal as they are very curious, they have also some strange rules, like sealing our hand held VHF, that can not be used while we are on land. Then there is the marina formalities. More forms to be filled and more bureaucracy. We have the impression that there is always somebody watching, it looks like they are afraid that we will hide somebody in Zenitude. John went for a walk around the marina, there is an area that seems to have local boats, but it is out of bounds, he was not allowed to walk over there. In the marina we found out that two currencies circulate throughout Cuba - Cuban convertible pesos (CUC) and Cuban pesos, also called moneda nacional. For tourists prices are quoted in CUCs, which is equivalent to US Dollar, so everything, except coffee and rum is very expensive. So was the marina, quite expensive with almost nothing to offer, like toilets and showers without water, which makes them really impossible to use. La Habana is very nice as long as you stay in the 3 or 4 streets that form the tourist center. The rest is very poor. We were surprised with the amount of tourists around. Very few Americans, but otherwise, people from all around the world, specially Europe and South America. 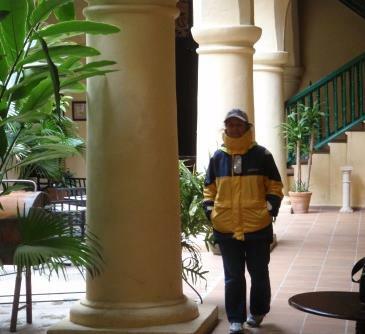 We spent 3 days visiting, 2 of them happened to be the coldest in record in La Habana after a Northern that came with very bad weather (global warming, must be). We had no choice but walk around in our foul weather jackets to keep dry and warm. We visited La Bodeguita del Medio, listened to music, bought coffee, rum and cigars. Went to La Tropicana for a fantastic show and tried several restaurants, until I got such a bad case of food poisoning with a pizza in one of the good restaurants. That was the end of eating out in Cuba for me. We left Marina Hemingway after about 2 hours of checking out procedures. Exiting the marina was tricky, it looked dangerous with confused seas. We had to do about 155 miles to the next anchorage and had to slow down to arrive with daylight. We haven’t been able to buy the paper charts as they were out of print, no surprises here as it is hard to find anything in Cuba. On top of that, navigation marks are inexistent or unreadable (sometimes a tree stick is the mark) so it is hard to get in and out of places. We have electronic charts but they are not always accurate, specially to navigate between the channels in the reef. Another cruiser in the marina had given us waypoints to enter Cayo Levisa. It is a winding way between shoals. At some point the waypoints were not making a lot of sense and sure enough we run aground. We found out later that one of the waypoints was missing. A small detail in a zigzagging route. Twenty dollars later the fishermen got us out and we were able to find anchorage. We left the anchorage in Cayo Levisa via the other end called Quebrado de San Carlos. Even with waypoints, marks and explanations from 'local knowledge' we had a very hard time to find the way out to sea, first avoiding shoals and then finding a way out thru the reef, it is a dangerous area. Most of the time so far the wind is about 10 kn more than predicted, about 22 knots from the NNE and we are sailing fast on second reef, no jib. During the night the wind calmed down and then early morning it picked up again and we added the jib for the last part of trip. We arrived at Marina Los Morros for the entry pocedures, as it is required to check in and check out in every port. This time it was a little faster. It is a terrible dock and there is no much here, just some fishermen, a restaurant and a hotel nearby. There is nothing to buy, except bread. Oscar is trying to find out where to buy fish and lobsters but the weather has been very bad lately and fishermen have nothing to sell. They told us that the anchorage across the bay in Cayos de la Lena is good and Oscar can look for lobsters hidden among mangroves. It sounds very strange but they swear there are lots of them there. We arrive at Cayo de las Lenas anchorage, the place is nice among mangroves and it is very protected, the forecast says there is a front coming and we decided to wait here as we do not want to turn Cabo San Antonio in bad weather. We haven't seen any other cruising boats. As in every place we've been so far in Cuba, entering the anchorage was tricky. We had to enter thru a very shallow patch of water but at least here the water is calm and clear and it is possible to see the bottom. Inside there are good spots to anchor, but many shoals. Oscar did try to look for lobsters among the mangroves, following to the fishermen tales, but got a big scare as the sand started to swallow his fins, it was a quick jump back into the dinghy after that and no more business of going after lobster or anything else between the mangroves. Cayo de la Lena, lobsters? No, but mangroves want to swallow Oscar! I can bake delicious bread ! When we left Cayo de la Lena we had to stop by in Los Morros again to check out. You have to tell the authorities the exact route and the places that you are planning to stop. They have to authorize you to stop where there is no Coast Guard, so you need to claim that you will stop for safety reasons. Our plan is to go to Cayo Largo but we want to do several stops along the way. For this trip we want to travel along the north side of Isla de la Juventud in the protected waters of Golfo de Batabano stopping at several cayos. Los Morros is at the North West tip of Cuba and soon after leaving we were sailing in the infamous Canal de Yucatan. Here we got the Gulf Stream current and we were dragging along with 2.5 kn of current against, but it was very calm, actually perfect weather for this part of the trip as any bad weather can make this area quite dangerous. We sailed thru the night and next morning, after we entered Golfo de Barbatano we saw one of the fishing boats, the first fishing boat we saw actually fishing, and then disaster struck. They were dragging a large net behind, as fishermen often do, and we were distracted with the possibility of finding the so much sought after lobsters. We didn’t see the net and we run on top of it with the 2 propellers! It took 2 hours of hard work for Oscar to free the propellers from the net. We were concerned that the seals might be damaged but we didn’t see any oil in the water so we are hoping seals are not damaged. The disappointing part was the scuba tank we had just filled in marina Hemingway was almost empty, so Oscar had to do all the work in free diving which was a big effort. We are left with the suspicion that the guy in the marina didn’t fill the tank properly. It is a new tank and we don’t think it can be losing air so rapidly. After all the hard work we kept going and arrived at Cayo Siju, just next to Cayo San Felipe early afternoon. We are in a very nice anchorage with beautiful mangroves but by now we find that we had enough mangroves for one trip. We are actually hoping to find reef soon where we can swim, snorkel and spear fish (this last one for Oscar only). So we just spend the night here and early morning the next day we keep going. We encounter head winds, so we are tacking to avoid motoring against the wind. The night falls and we are close to our anchorage but not quite there yet. We will need to anchor in the dark. The anchorage we selected was easy to approach in the dark and being a very calm night we had no problems anchoring. It was an early night after a long day sailing and we had a good rest before resuming next morning. We needed to negotiate a cut, Paso La Cruz, among shoals and reef. We were told this was an easy pass, I can’t imagine what a difficult pass might be then. We managed, because we are a cat, I think anything with a bit more draft would not make it. I was in the bow trying to guess where the deeper water was while John was trying to guess the navigation marks (tree sticks) and we went thru some really shallow spots. 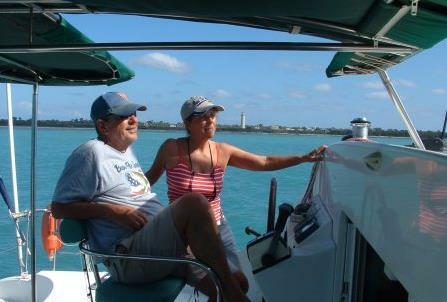 Finally we made it and were in deeper waters again for another day sail towards Cayo del Rosario. One of the scary thoughts in this area is to know that there is no ‘rescue’ service, except of course for some tour operators or fishermen if they happen to be nearby. Luckily we didn’t need to be rescued. 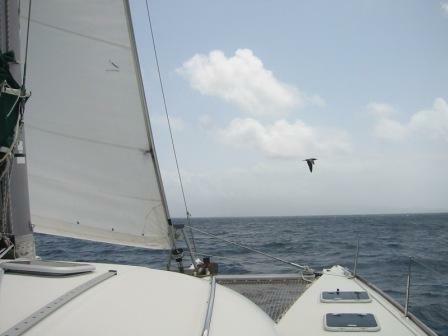 Another day sail and we are heading towards Cayo del Rosario. Mangroves seem to be a thing of the past and we start seeing clearer water and reef around us. While underway we spot another fishermen boat and this time we approach them very carefully. We make contact with the men. 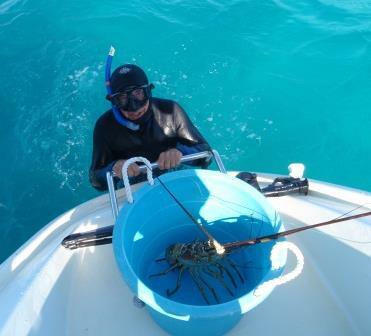 We have finally found what we were looking for: lobsters! Thousands of lobsters that they keep in big cages in their boat. Cages are built in the bow so that they are constantly in touch with sea water. This is a way to keep the lobsters alive and fresh while they spend 2 weeks at sea fishing. There really has to be plenty of lobsters at sea. It is unbelievable the amount they have. As we've been told before all of them belong to Fidel. The fishermen invite us to raft alongside and we exchange gifts. 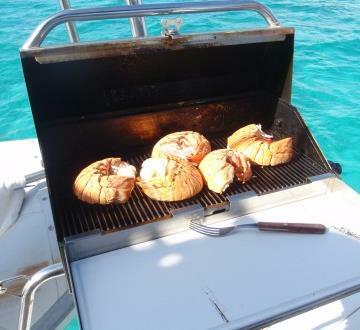 They give us lobsters and we give them rum and some goodies we have for their kids. The guys are nice and desperate for company, they invite us for dinner but after all the rum we have given them we decide we better decline and soon we are underway again. But there is no doubt: tonight is lobster for dinner! 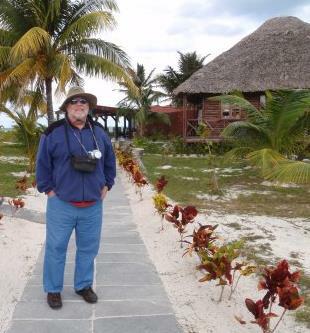 Early morning we leave Cayo del Rosario to cover the 25 miles to Cayo Largo. We had to cross a cut in the the reef to get out to sea in Canal del Rosario, it was another scary experience even in calm weather. It didn’t help to see the wreck of a catamaran lying on top of the reef. This part of the south coast is very nice with clear water and reef all over the place, Oscar was making note of all the places he would like to dive. We hope to get some information in the marina in Cayo Largo. When we arrive we find a modern marina with floating docks. There is a charter company here as well so for the first time since we are in Cuba we see several boats around. There is a dive operator as well and he tells us where to go for diving. Next day we go around to several places and it is a lobster feast with Oscar finally catching as many lobsters as we can eat. We enjoyed Cayo Largo for 3 days, but it is time to keep going, there is a window for the next leg, about 150 miles to Grand Cayman and we decide to go. Cuba is a big country and we have seen very little of its long coast but I leave thinking that it was enough for me, I am ready for less lobsters and more freedom. There is no much here, a hotel, a restaurant, a dive operator and a nice beach. Buying bread was an ordeal as the guy form the hotel sold us some bread from the restaurant, apparently against the law as hotel, restaurants and all contents belong to government. The poor guy that sold the bread didn’t even have a bag to store it, so we had to go back to the boat and bring a plastic bag. After that experience I decided to try my own bread. 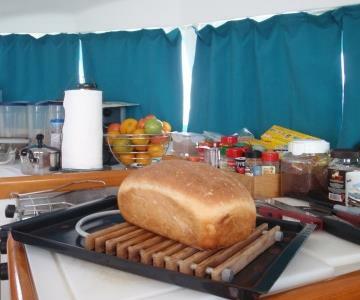 What a success, I can bake bread!